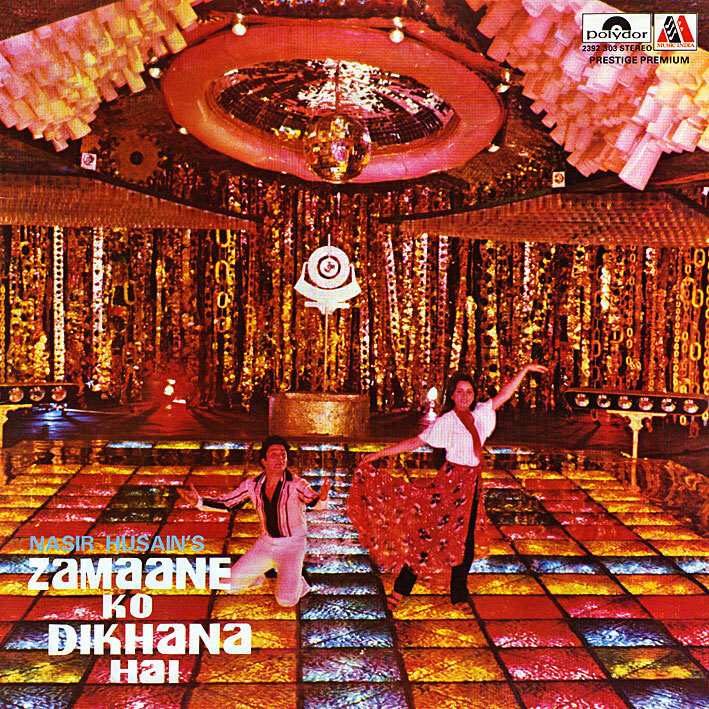 'Zamaane Ko Dikhana Hai' is RD Burman in 80s disco mode; something of an acquired taste. Truth be told, had it been my first meeting with Bollywood soundtracks, this blog wouldn't have existed; I'd never have delved further. More often than not I find Hindi disco too tacky, too tinny, not funky or dirty enough. I also have issues with the vocals; large, booming ones like Kishore's and RD's own, for all their qualities, aren't suited for it. That said, this is Burman, so there will be redeeming features. There's a shortage of really remarkable, fully formed tracks on this album, but as almost always there are instrumental twists and turns to enhance even the the most pedestrian of songs. 'Dil Lena Khel Hai Dildar Ka' and 'Bolo Bolo kuchh To Bolo' (the latter including a nod to 'Yaadon Ki Baaraat's wonderful 'Chura Liya Hai Tum Ne') should therefore warrant a few listens. There's plenty to sample for those who dabble in that sort of thing. My favourite here is probably 'Hoga Tumse Pyara Kaun'. More traditionally Indian sounding than the above, but with an infectious groove, subtle strings and interludes featuring what sounds like an electronically enhanced flute. Nice. Song picturizations are blinding though! Burman had some kinda reserved energy for Nasir Hussain films and Ramesh Behl films. The entire soundtracks are wonderful right from the 1st song on Side A to the last song on Side B. Teesri Manzil, YKB, HKKN, Jawani Diwani, Yeh Vaada Raha just to name a few. However, this one is really not as effective as the others. I still love the Nepali folk sounding "Poocho na yaar kya hua" it is actually inspired by a Nepali song "Cheso Cheso Hawa Ma". Asha Bhosle shared a little memory at her concert that R D had gone to Nepal to actually get some folk tunes since some part of movie was to be shot there. R D heard a bunch of farm girls singing this song while on their journey home and recorded it right there. Bingo! PC, the qawali 'Pari Ho Asmani Tum' and 'Hoga Tumse Pyara Kaun' does it for me. I actually memorised the whole qawali. Silly things I did in my youth! Love this album! A tad disappointed though that no one ever released on audio the first song in the Bolo Bolo medley, or the Joseph Alvares's "There could be so much joy to living", but I guess that's to be expected since a lot of these old movies had songs on audio that were never picturized and vice versa. IMO every song has something unique to offer: I totally dig the varying interludes in "Puchho Na Yaar Kya Hua", the dramatic intro and speech in "Dil Lena Khel Hai", the clinking flatware sound reminiscent of the glasses in YKB's Chura Liya and the disco rework of Puchho Na in "Bolo Bolo", the Nepali folk vibe in "Hoga Tumse", and the modern twist on the usual qawwali form in "Pari Ho Asmani Tum". One of my favorite 80s soundtracks, top to bottom. Thanks for sharing! i have this record and rented the vhs a bit ago, the girl is a total babe!!!!!! Thanks, PC. I have to agree with those who give this album the thumbs up. It may not be among his best work, but definitely worth having.